Like everyone else in Birmingham, transport authority Centro were kept in the dark about the HS2 project, including the route, and where the Birmingham station(s) would be. But when the scheme was launched in 2010, Centro was quick to offer support. It announced that future extension of the Midland Metro tramway would include a connection to Curzon Street HS2 station. At the moment, the Midland Metro terminates at Snow Hill station. The £129 million Birmingham City Centre Extension (BCCE) aims to extend it about 700 metres on-street, to the Stephenson Street side of New Street railway station, by 2015. New Street station is being refurbished as part of the ‘Birmingham Gateway’ development. The BCCE was originally intended to Five Ways, on the Hagley Road, but this was supplanted by the council’s preference for an extension to Birmingham Airport, to be implemented “after 2015”. As part of its propaganda for HS2, Centro have produced a diagram showing the Midland Metro running from Birmingham city centre to all the way to Bickenhill HS2 station, with an end-on extension from the BCCE at Stephenson Street. Birmingham Gateway and Midland Metro BCCE were retrospectively declared to be components of Birmingham city council’s November 2010 ‘Vision for Movement‘ (VfM). 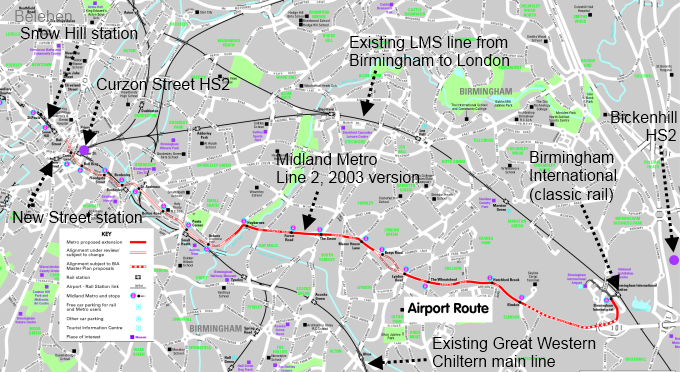 This inferred that the 2003 Airport Midland Metro expansion had been ditched in favour of a completely different route. 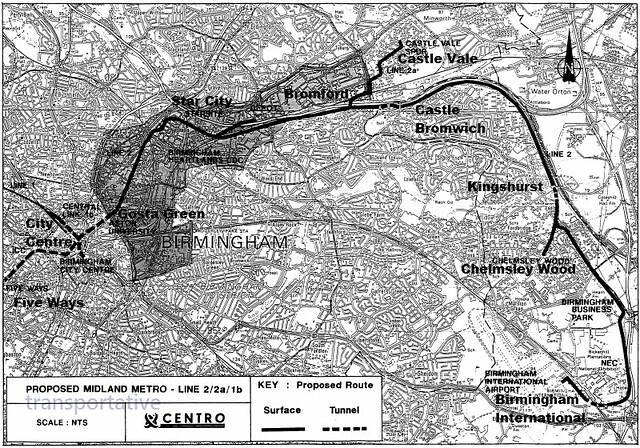 Centro had previously tried to impose an east Birmingham route for its airport Line 2 in the 1980s and 1990s, running into massive public opposition on each occasion. On closer inspection of the 2010 Vision for Movement plan, it turns out that the tramway to the HS2 Curzon Street station is not shown as being part of the Midland Metro BCCE, but as a separate ‘rapid transit’ (possibly bus) route between “Eastside” and Centenary Square. The BCCE is shown as terminating at Stephenson Street, the A45 route to the Airport is resurrected, but the link to Bickenhill HS2 isn’t shown. Public transport planning in Birmingham is in disarray, with schemes being made up by Centro, and Birmingham city council, on the hoof. 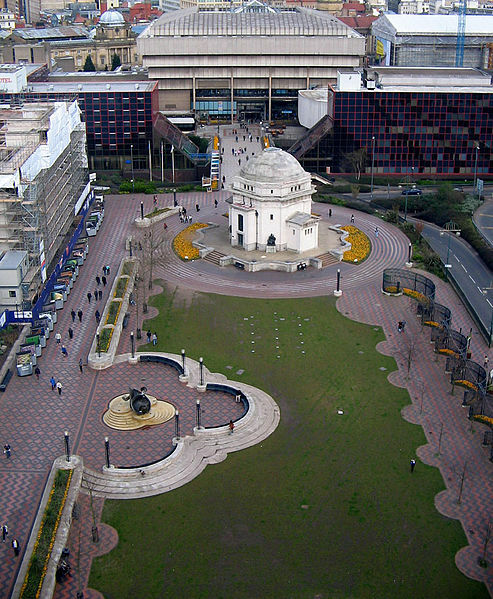 When the area around the former Bingley Hall in central Birmingham was redeveloped in the late 1980s/early 1990s, a new public space, Centenary Square, was included as part of the scheme. On completion, Centenary Square was used for various temporary exhibitions and events, although this had not really been foreseen at the planning stage. Not long after opening, Birmingham city council had to replace the paving in the square, as a result of this unanticipated wear and tear. Although Centenary Square has continued as an event space, it’s never been entirely satisfactory in access, safety, or aesthetic terms, because of layout decisions taken at the time of redevelopment. The Square’s paved area is broken up by irregularities, such as the platform of the destroyed ‘Forward‘ statue, and footfall churns the grassed area into an unsightly muddy mess. Upon its completion, Birmingham city council started to use the unnamed quadrangle in front of Millennium Point for events such as the annual Christmas lights switch-on concert. Millennium Point lies outside the traditional city centre, over a kilometre away from Centenary Square. Its shortcomings were laid bare on 14 November 2009, when a breakdown in crowd management led to a concert having to be abandoned after a few minutes. In 2010, there was no Christmas lights switch-on concert, the city council having been unable to identify a suitable location for such events. In spite of all this, the council have switched on an unsolicited outdoor BBC/Olympic television screen at Waterloo Steps in Victoria Square. Over the years, Victoria Square has been remodelled several times, and much of its area is now made up of a water feature, surrounded by steps. Is this consistent with safe management of large crowds? With a swing towards light touch regulation, health and safety seems to carry different weights at different times. In Coventry, another outdoor screen is being set up on the wall of the Transport Museum. The space in front of the museum, Millennium Place, has an uneven surface. Coventry city council has decided that Francoise Schein’s world time clock would make the area unsafe for large crowds watching the screen, and wants to remove it. The BBC reported the clock had been covered over for previous events, at a cost of £10,000 a time. The difficulties in Birmingham and Coventry highlight some local authorities’ limited capabilities in designing and maintaining usable public space. Part of the attempt to post-rationalise the High Speed Two scheme has involved suggesting that Great Britain is falling behind in “connectivity” compared with other countries, and that ‘agglomeration benefits’ particularly accrue from high speed rail. But the evidence from European counterparts suggests that it’s Great Britain that generally has the connectivity advantage in large city pair journey times, and service frequencies. One example comparison is the fast journey time between the capital and second city in France, Italy, Germany, Spain, and Great Britain. This is not an unrepresentative result. Generally favourable outcomes arise when comparing British frequency of service, or journey times, with other internal city pairs within continental Europe. The fact remains, however, that electric cars and the like may make driving kinder to the environment but they don’t require people to make the fundamental lifestyle adjustments that are required if we are serious about tackling climate change (living more locally, for example). In that case, why is Centro – pteg’s biggest member – backing a massive increase in long distance commuting, in the form of the Birmingham to London High Speed Two rail project? According to consultants Booz, without noise abatement, 25,000 properties would be affected – but “only” 4,700 with control measures in place. In terms of absolute sound levels, the biggest mitigator would be to put distance between people, and the noise nuisance itself – but in densely populated Britain, that’s easier said than done. The zone of HS2 intolerable sound would obviously be far wider than the nominal “22 metre” fenced p-way; and the zone of annoying sound, even wider still. Eurostar says it still doesn’t know what caused the mechanical fault that led to around 600 passengers being stranded on a train for five hours. Police received reports of passengers on the 17.15 London-to-Paris service smashing windows to get air into the carriages of the train, which was stuck just miles from the station. To a considerable extent, HS2 noise mitigation is an exercise in exchanging one type of environmental degradation, for another. If large sound fences are installed alongside the track, that would have a corresponding visual impact. The view from the trains wouldn’t be particularly appealing, either. When the Labour government announced High Speed Two in 2010, West Midlands transport authority Centro was quick to give backing – even though it’s supposed to be concerned with local public transport, rather than long distance schemes. Centro’s support for high speed rail at the national level contrasts with its policy for the West Midlands, which is focused on Low Speed Rail, branded as ‘Midland Metro‘. Midland Metro is the name used by Centro for its tram system – which consists of one line opened in 1999, running from Wolverhampton to Birmingham via West Bromwich, mostly along a former railway trackbed. This is called Midland Metro Line One, but could equally be described as Low Speed One – since a journey along it takes 35 minutes, compared with 23 minutes on the former Great Western railway in 1958. The railway used to offer fast through trains to other destinations – including Leamington Spa, Bournemouth, Shrewsbury, Oxford, and London – but the farthest that Low Speed One passengers can go is Birmingham, or Wolverhampton. but so far, the only extension to have been part-funded by government is a £129 million extension of Low Speed One from Snow Hill station to New Street station, which are 700 metres apart in Birmingham’s city centre. Birmingham Airport (‘International’ station) is currently served by trains from central Birmingham (New Street), which take 9-10 minutes. The journey on Midland Metro to the Airport would take at least three times as long, fully deserving the title Low Speed Two. Centro – the public transport ‘promoter’ – has done almost nothing, apart from spending £14 million on car parks at stations. For years, marketing has been inept, with two attempts at rail-specific branding (‘Westmidrail’ and ‘Midline’) discarded. And from the bar charts, there’s no evidence that the 2005 ‘Network West Midlands‘ cross-modal branding has had any effect. The only track electrified since Centro was set up (in 1969) is the ‘Cross City Line‘. It’s unlikely that Centro – in its current form – has the wherewithal or vision to deliver a versatile regional rail system, as opposed to the current ‘collection of lines, that run into Birmingham’. Centro’s priorities lie elsewhere. Although it’s supposed to promote local public transport in the West Midlands, it has spent £70,000 on lobbying for High Speed Two, the controversial intercity rail project. Centro has failed to protect land and rights of way for future regional transport use. In 1972, it facilitated the closure of the passenger rail service between Birmingham, West Bromwich, and Wolverhampton Low Level (and Birmingham and Smethwick West). In the 1990s, it spent £150 million restoring the Wolverhampton line, but as a low speed tramway (Midland Metro Line One) – whose existence is a major obstacle to creating an effective regional rail system.